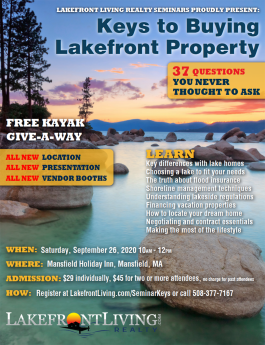 Why Use a Lakefront Specialist? Why Hire a Lakefront Specialist? What Are the Dangers of Overpricing? Lakefront Living "In The News"
Is it time for you to experience living in one of the thousands of lakefront homes on the market? LakefrontLiving.com is your one-stop shop for EVERY lake property for sale on the lakes we cover. We’re ALWAYS up to date…every lakefront real estate listing on our site is available, including luxury and vacation waterfront homes. Stop wasting time navigating around several websites to find your dream lake house or property. We want you spending your time with your feet in the water, not chasing down inaccurate listings. And remember, you’re not just buying a lake house, you’re buying a lake! We painstakingly documented thousands of lakes & ponds so you can make an informed decision. Feel free to explore…and welcome to the lake life! a mission to passionately unite buyers and sellers of lakefront property. We have a huge selection of vacation, luxury and affordable lake houses for sale across Connecticut, Massachusetts, Missouri, New Hampshire, Ohio, Rhode Island, Tennessee, and many other states across the U.S.
Changing lives...one lake house at a time. Click here for a tutorial on the new Lakefrontliving.com! Don't make a mistake on the lake! Thank you for joining. I look forward to keeping you informed about lakefront properties and the lakefront lifestyle! We NEVER share your information with anyone else. You can unsubscribe at any time.